Whittlebury Park Golf & Country Club is set in over 600 acres of picturesque parkland, designated a site of special landscape beauty with magnificent oaks that are hundreds of years old, and over a dozen fresh water lakes. We are the Official F1 Racing Magazine Fan Village for the British Grand Prix. 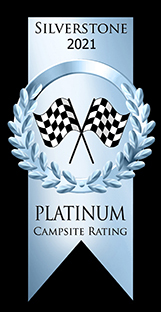 We provide camping for all Silverstone race meetings throughout the year with easy access to the circuit and a friendly professional team onsite to ensure you have the best stay possible, regardless of what the great British weather throws at us! Grey Water Point Other facilities: Caravans and mobile homes also catered for, beer tent with entertainment over weekend for large events, SIA licensed security on site, direct circuit access via footpaths to gate 5 & 8, washing up area, disabled facilities, championship golf course, corporate multi-activities i.e clay pigeon shooting; hovercraft, archery plus many more, 40 en-suite bedrooms.